Secure your ignition thanks to the ignition distributors 123 Ignition. Indeed, this ultramodern electronic igniter works on the principle « Spark-Balancing » like the engines of Formula 1: if a cylinder is less powerful, the system reacts by modifying the ignition point of each cylinder which allows the balance. After the installation, the ignition of your car will be electronic and not mechanical. Moreover this box removes the following elements: points, control pressureâ€¦ In this way many sources of breakdown are eliminated. Possibility of choosing between 16 setting curves according to the model of your vehicle. You just have to turn the dial of the igniter on the setting indicated in the manual supplied. You can select one of the 16 configured curves corresponding to your engine. The french installation manual provided with the ignition distributor shows how the original Bosch ignition distributor references correspond to the curve to be selected on the 123. Possibility to choose between 16 adjustment curves. 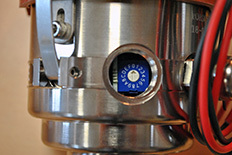 You just have to turn the ignitor wheel on the indication indicated on the manual delivered with. Function only with the 3 poles version of the HKZ box. If your car is equipped by an HKZ box, you have to use the original coil. Posibility to choose between 16 adjustment curves. Without or with the HKZ box (doesn't work with the 3 pole version).